Long commutes are nothing new to residents of Vacaville and Fairfield. More than 40 percent of Solano County residents leave the area for work, traveling for an average time of 30 minutes. And, most travel alone by car, truck or van. Studies show that commuters can have higher blood pressure, suffer more headaches and chest pains, and often express negative moods at home in the evenings. It doesn’t have to be that way. NorthBay Center for Primary Care internal medicine physician Dinesh Nagar, M.D., finds his 40-minute commute gives him time to relax and transition from physician to husband and father. His first rule of the road is to plan plenty of time to get to his destination. Fighting traffic congestion is a major cause of stress, but if you know you have time, it’s easier to relax. 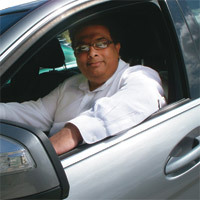 Dr. Nagar has outfitted his car with a hands-free, wireless phone system that makes it easy for him to call friends on the East Coast or to take care of personal business. By the time he gets home, all of his phone work is taken care of and he can focus on his family. Playing soothing music, listening to a good talk radio station or enjoying an audio book can also ease the stress of commute time. Study a map in advance of your trip. Become familiar with the route you’re driving. Studies show that drivers with multiple route changes are more likely to become angry drivers. Always carry a cell phone with you. Keep your vehicle in good working order. If your car breaks down, stay with your vehicle and call for assistance. Never accept a ride from a stranger. At night, stop for gas at a well-lit service station with an attendant in view from the pumps. Carry road safety tools, such as a jack, flares, and small cones. Avoid eating while you drive; secure drinks in sturdy cup holders.